World No. 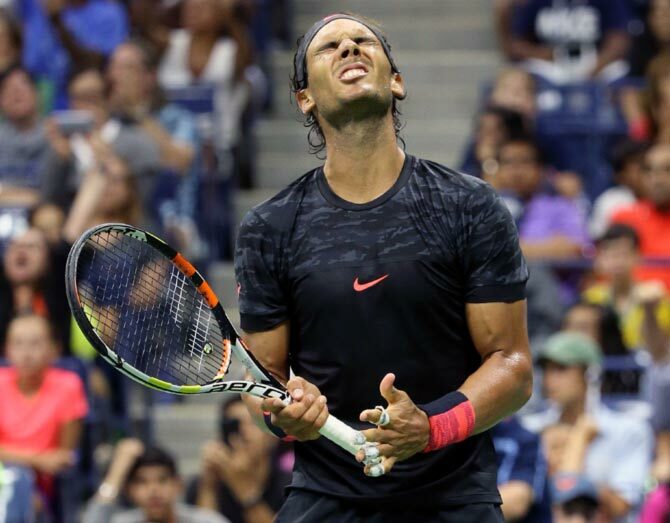 1 Serena Williams crashed out in the semi-finals of the OpenSeeds seemed to be just a number at this year's US Open as several top-ranked players suffered shock defeats at the hands of lower, or even unseeded competitors - the latter happening to World No. 1 Serena Williams, who lost to Italy's Roberta Vinci in the semi-finals of the US Open, ending her opportunity for a Calendar Grand Slam.She wasn't the only one, however. Here are 5 of the biggest upsets at the tournament, which concluded last week with Novak Djokovic and Flavia Pennetta taking the men's and women's titles respectively. Kei Nishikori , a finalist last year, was the first big seed to fall on the opening day of the tournament. The fourth seed who has had a fine year by already winning 3 ATP tournaments this year, could not recapture his fine form which he had displayed in 2014 against world no 1 Novak Djokovic by reaching the final. Paire took the win 6-4, 3-6, 4-6, 7-6, 6-4. Showing remarkable fearlessness at the biggest moments, 30-year-old Cetkovska of the Czech Republic, who was out for seven months with a hip injury, fought off four match points, spanking winners on every one of them, going on to score the biggest upset of this year's tournament, taking down Caroline Wozniacki, 6-4, 5-7, 7-6 (1) in a late night match in Arthur Ashe Stadium. This was Wozniacki's third second-round loss at a major this season, along with the Australian Open and French Open. She made it to the fourth round at Wimbledon. Anderson, known mainly for a booming serve but terrific off the ground in this 4-hour, 18-minute victory, it marked a real breakthrough: He entered with an 0-7 record in fourth-round matches at majors, including when he had a two-set lead against Novak Djokovic before losing at Wimbledon two months ago. Murray watched 130 mph aces zoom pass him , and then sat in his changeover chair and cursed at himself, over and over and over. Adept at comebacks — in the second round, he recorded his eighth victory in a match after dropping the opening two sets against Fenchman Adrian Mannarino – Murray did push Anderson to a fourth set, but the South African kept his cool and closed out the match in the tie break. Anderson took the win 7-6, 6-3, 6-7, 7-6. The loss ended eighth-seeded Nadal's record streak of 10 years in a row with at least one grand slam singles title after the Spaniard fell in the quarters at the Australian and French Opens, and was ousted in the second round at Wimbledon. The final set produced spectacular rallies and winners that had the Arthur Ashe Stadium crowd on their feet up to the 1:26 AM finish as they traded seven service breaks in a row from the third game of the fifth set before Fognini held to end the 3 hour 46-minute marathon. Fognini took victory 3-6, 4-6, 6-4, 6-3, 6-4. 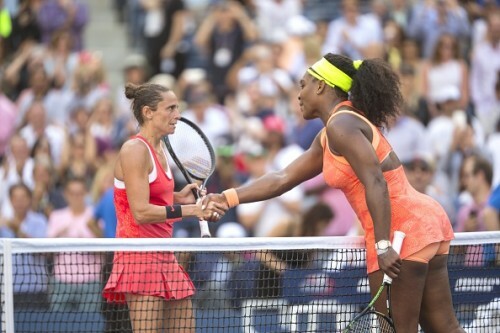 Serena Williams lost to Roberta Vinci of Italy , which ended her possibility of a calendar Grand Slam title. But congratulations are still in order for Williams for her incredible pursuit to make history on the tennis courts. Williams was attempting to become the first woman to win all four majors in a season since Steffi Graf in 1988. She also could have tied Graf for the second-most Grand Slam singles titles behind Margaret Court's 24. Vinci would go on to face countrywoman Flavia Pennetta( Eventual champion), who defeated No. 2 seed Simona Halep( semi final), the US Open final.